For this year’s paramedic services week, Lyle Karasiuk of Parkland Ambulance has a very simple message he wants to get across. If you encounter someone in distress, call 911 but then stop and stay with that person. Maybe you’re the one who can help. 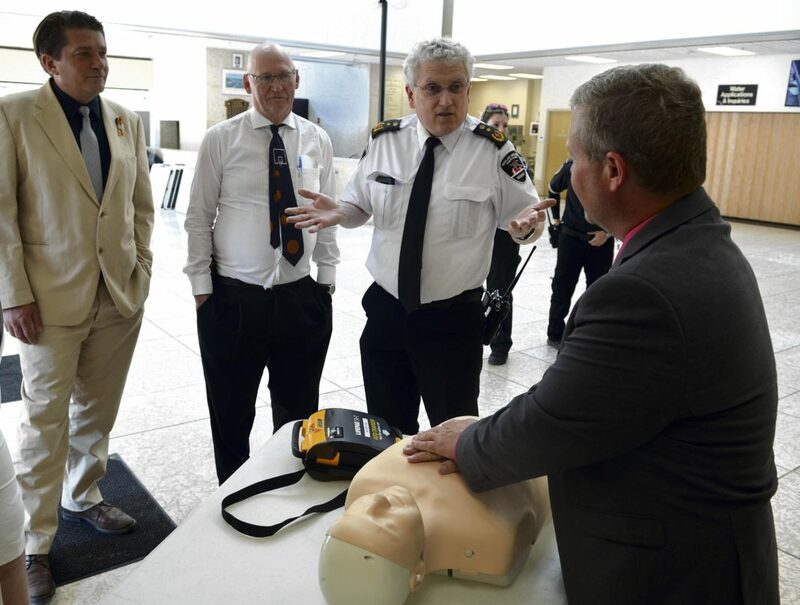 Monday he was at City Hall, giving members of city council a quick demonstration on how to do CPR and how to use an automated external defibrillator (AED). It wasn’t a full certification training session, merely a quick lesson on what to do if someone were to collapse in front of you. “We’re explaining to council the simple actions of CPR and using an AED. It’s a great opportunity for us to talk to council and to talk to the general public,” he said. Often, Karasiuk said, people do call 911 if they see someone in distress. But then they leave the area, which can make it hard to determine what care is needed, or, if someone is having a cardiac episode, can delay lifesaving CPR. First, Karasiuk said, call 911. But then stay with the person. If they’re not responding, start chest compressions. It will either wake them up or save their life. “If they’ve had an unconscious episode for some other reason, you’re going to wake them up by physically pushing on their chest,” Karasiuk said. The next step would be to get someone to go get an AED. The device will walk you through next steps itself. “Simple actions are so important,” he said. In a formal training session, Karasiuk would also talk about how to do chest compressions and ventilations with a barrier device. But out and about, without a barrier device, don’t worry about breathing into the person’s nose or mouth. In fact, he said, without a barrier device of some kind, paramedics won’t do those ventilations. What’s more important, he said, is to call for help and to start pushing. If you do call and stay on the line, dispatchers will guide you through next steps to care for that person, regardless of the medical issue they’re facing. “We want to make sure when the public does CPR, just find the centre of the chest and push. All it is is just pushing. If you phone and start pushing, that’s all you have to do,” Karasiuk said. That pushing is about an inch and a half to two inches, or five centimetres. It is a lot of work, and ribs may crack, but as Karasiuk said, it’s better to have a few cracked ribs and live than to have a stopped heart. “We want people to realize it’s simple,” he said. At the very least, he said, just stop. “They’ve seen something. They’ve called,” he said.